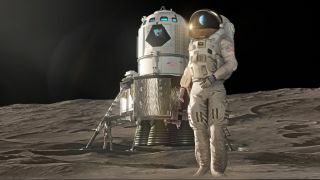 Lockheed Martin has revealed a design for a lunar lander that it hopes will take astronauts to the Moon in 2024. The company has outlined a plan that ties in with NASA's work on human space exploration, and if successful, would take the US to the lunar surface four years earlier than originally planned. The accelerated timeline seems to be a response to the growing list of other nations planning to leave their footprints on the Moon, including China, Israel and India. Are we getting close to finding Planet Nine? Lockheed Martin hasn't announced how much more the abbreviated timeline will cost, but has said it will need extra resources to hit its new deadline. “To have a lander ready in 2024, we need to start bending metal next year, with tooling in-house now,” said director of human space exploration strategy Rob Chamber. Lockheed Martin isn't the only company working with NASA to press ahead with a new manned mission to the moon, and has noted that it will be a collaboration between many businesses. The company has released a video illustrating its concept in operation, touching down on the lunar surface, which you can watch below.